Whitney Clark didn't think her job as a cook at a Houston fast-food restaurant would mean she would have to endure taunts about her weight or demeaning physical labor. 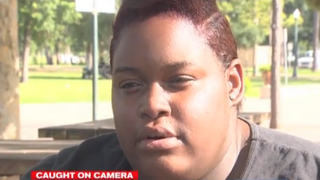 "I just [didn't] let it get to me because you hear it over and over and over," she told KHOU 11 News about the daily fat jokes her Whataburger manager allegedly made. But Clark told the news station that things took a turn from insulting to physically ridiculous. "She said we've got to get on our hands and knees and clean the floor with a toothbrush," Clark told the news station. Clark's mother, who couldn't believe that her daughter was asked to clean the fast-food restaurant with a toothbrush, shot cellphone video through a window of her child on her hands and knees cleaning the dining room floor. According to Clark, she was also asked to clean the men's and women's restrooms using the same toothbrush. In all, the daily process would take Clark up to four hours a day. "And the worst part was I didn't even think to put gloves on and they didn't even have the gloves out," Clark told the news station. According to KHOU 11 News, Clark has knee pain and walks with a slight limp. She has "filed a workman's comp claim and has also lodged a complaint with the EEOC." A Whataburger representative told the news station that Clark was given a tile and grout brush, not a toothbrush, to clean the floors. "One of our core values at Whataburger is to treat others with respect. We also pride ourselves in providing a safe and clean working environment," read a statement released by Whataburger. "Therefore we ask all of our employees at all levels to participate in keeping our restaurants clean for our customers." Read more at KHOU 11 News.